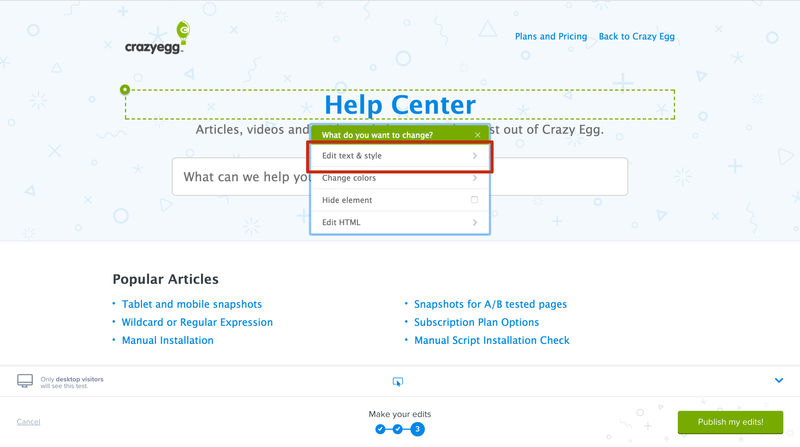 Crazy Egg allows you to quickly make changes to your site on the fly. The editing tools allow you to change elements like the copy, font colors, or even hide elements entirely. 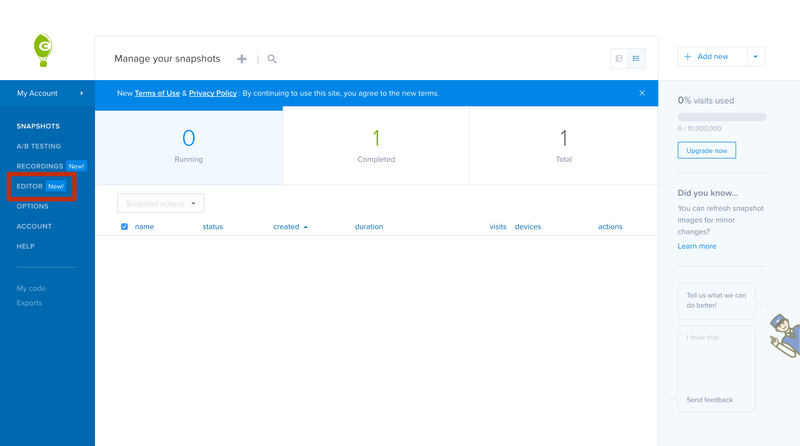 Once you're ready, you can publish your changes directly on your website! 1. Go to the Editor. 2. Click on Make your first edit now or the plus (+) at the top of the dashboard. 3. Enter the page you want to edit. 4. Then choose the device type these edits will appear on. In this example, we're going to edit the desktop view. 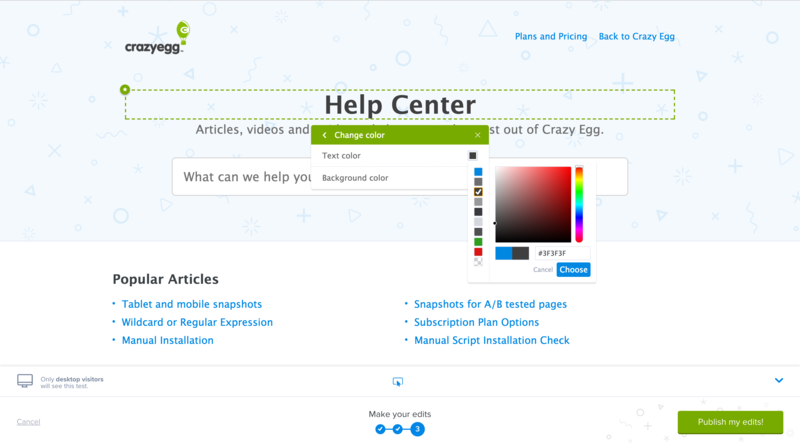 Next, we'll start to use the Crazy Egg Visual Editor to make changes. 1. Once the editor has loaded your page, select an element that you want to edit. For example, let's select the "HELP CENTER" title. 2. Click on Edit Text & Style. Use the inline editor to change the text. 4. Click on the close button (X) once you are done. 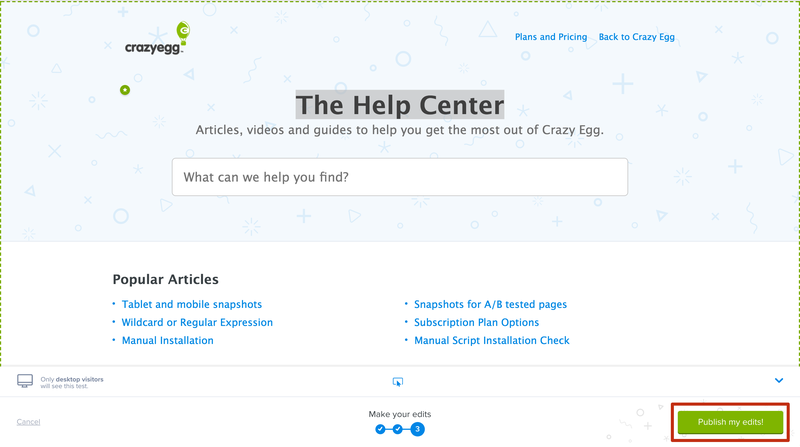 Here, we've changed the copy from "Help Center" to "The Help Center". 5. Repeat steps #1-4 to create more changes to other areas of your site. 6. Click Publish my edits! once you have finished creating the changes to your site.